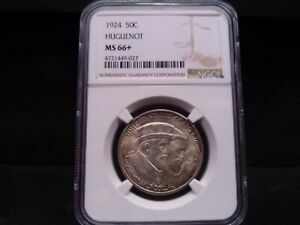 When it debuted in 1924, the Huguenot-Walloon half dollar set off a flurry of controversy. 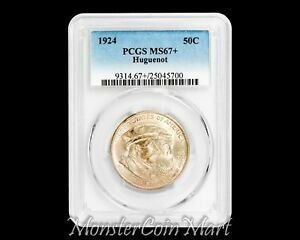 Aggravating on a number of counts, it was criticized by civil libertarians as religious propaganda, by constitutionalists as a violation of the First Amendment separating church and state, and by numismatists and other aesthetically-attuned individuals as mediocre artwork. Attacked primarily for its theme, it really isn't that much different from the Pilgrim half of 1920-21 in that it partly honors religious refugees. 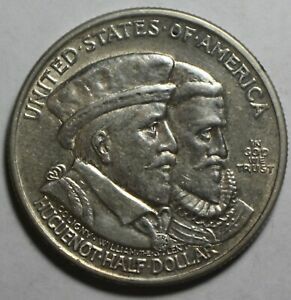 Yet the Huguenot-Walloon issue erred most in depicting on its obverse two individuals who were entirely unrelated to the principle event being commemorated - the founding of New Netherland in 1624. Huguenots and Walloons were really one and the same; Walloon was the name given to Huguenots (French Calvinists) living in southern Belgium. Periodically persecuted in Catholic France and in Holland (then partly ruled by Spain), they sought refuge outside of Europe in the New World. Toward this end, 30 families of Walloons were persuaded by the newly-formed Dutch West India Company to colonize New Netherland. This region was broadly defined as the lands between New France (Canada) and Virginia. They landed in 1624 and created the settlements of New Amsterdam (now New York City) and Fort Orange (now Albany, New York). Forty years later, these lands passed into British rule, remaining under this authority until Americans declared their independence in 1776. 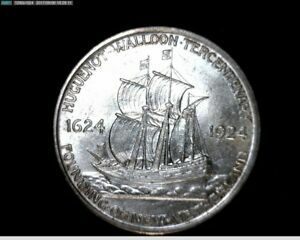 Seeking to honor the 300th anniversary of the arrival of the Walloons, an organization calling itself the Huguenot-Walloon New Netherland Commission approached Congress with a plan to coin commemorative half dollars marking the event. Revenue from the sale of these coins would be used to offset the expense of public celebrations planned for 1924. 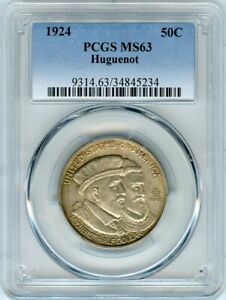 Objections were raised immediately over this legislation, as the Commission's Chairman, the Reverend Dr. John Bear Stoudt, was associated with the Federal Council of Churches of Christ in America, a group which co-sponsored this coin issue. Despite the apparent violation of the doctrine of separation between church and state, Congress was persuaded to pass the Huguenot-Walloon bill on February 26, 1923. 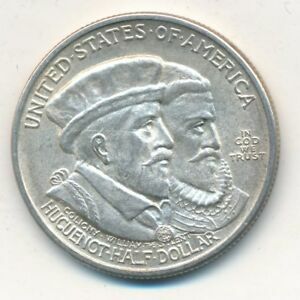 It authorized the coining of 300,000 half dollars to commemorate "the settling of New Netherland, the Middle States, in 1624, by Walloons, French and Belgian Huguenots, under the Dutch West India Company." Advised by Congressman Vestal, Chairman of the House Coinage Committee, that outside artists were unable to prepare models which would satisfy the requirements of modern coining, the Tercentenary Commission entrusted their coin's creation to the Mint's Chief Engraver, George T. Morgan. Morgan, then in his seventies, dutifully executed models based on ideas submitted by the Rev. Dr. Stoudt. 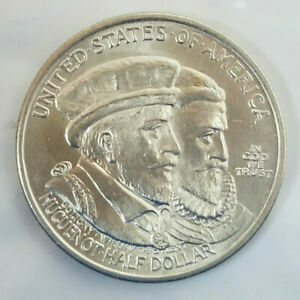 The obverse featured conjoined portraits of Admiral Gaspard de Coligny and William the Silent, two Huguenot martyrs assassinated decades before the founding of New Netherland in 1624. The inappropriateness of these figures in the overall theme of the coin only added to the objections already raised in response to its religious associations. In contrast, the reverse design was innocuous - a depiction of the settlers' ship Nieuw Nederlandt crossing the Atlantic. Problems arose, however, when Morgan's models were submitted to the federal Commission of Fine Arts on October 26, 1923. As was the custom, these models were forwarded for review to the sculptor member, James Earle Fraser of Buffalo nickel fame. The result of his examination is summed up in a letter from the Fine Arts Commission Chairman Charles Moore to Mint Director Robert J. Grant: "While the ideas intended to be expressed are excellent, the execution is bad. The lettering is poor, the heads are not well modeled and the ship is ill designed. 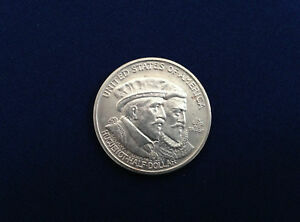 The workmanship is below the standard of excellence attained in previous coins. The models are therefore not approved." Political pressure was brought to bear, and a compromise was reached in which Morgan would revise his models under the supervision of Fraser. Past experience suggested that such an arrangement was likely to produce sparks, but to both men's credit the job was ultimately completed. Fraser, who evidently was a better sculptor than writer, nevertheless registered his protest with Chairman Moore in a letter of January 3, 1924: "It seems that Congressman or Senator Vestal advised them [the Tercentenary Commission] to have the coin done at the Mint because he informed the Walloon Commission that the artists who had made designs did not understand reductions of coins and made the models too high so that the coins had to be struck several blows before they were perfect, therefore the models should be made at the Mint. (Mr. Morgan has gotten in his good word against the artists again)." Within days of Fraser's letter, the Commission of Fine Arts reluctantly approved the final models. 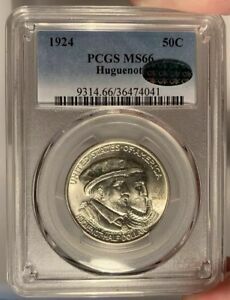 In February and April of 1924, 142,080 Huguenot-Walloon halves were coined at the Philadelphia Mint (the odd 80 pieces were reserved for assay). Of this total, 87,000 were sold to the public at $1 apiece through the Fifth National Bank of New York and through other groups which obtained quantities of these coins to market in conjunction with their local celebrations. 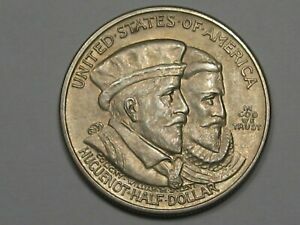 The official Huguenot-Walloon Tercentenary celebration was the one held in New York City May 17-22, 1924. It's possible that the coins may have been delivered in time to be offered during that event, but this fact is not documented. 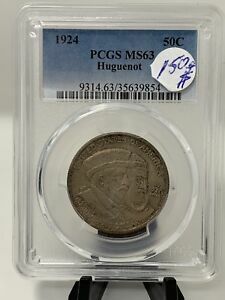 Coins of this type were still being offered by mail as late as 1929, the price then pegged at $1.50 plus two cents for postage. 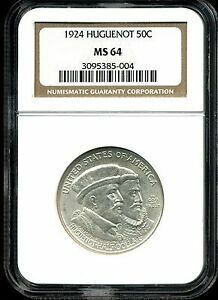 Curiously, the remaining 55,000 pieces coined were returned to the Philadelphia Mint for destruction but were reportedly released into circulation! The small number of truly worn Huguenot-Walloon halves does not support this proposition, but it's possible that most were immediately set aside by the public as curios. 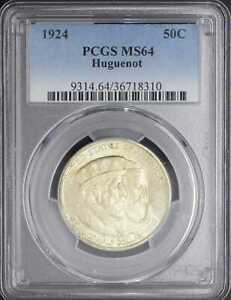 The balance of the 300,000 pieces authorized were never coined, leaving a net mintage for this issue of 142,000. The typical Huguenot-Walloon half seen today grades MS-60 through MS-64. Examples grading MS-65 are not especially rare, while those in grades MS-66 and higher are quite elusive. The luster on mint state coins is frosty, ranging all the way from dull to quite brilliant. 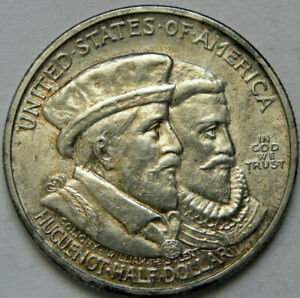 Some specimens will exhibit a V-shaped die-clash mark on Admiral Coligny's cheek. 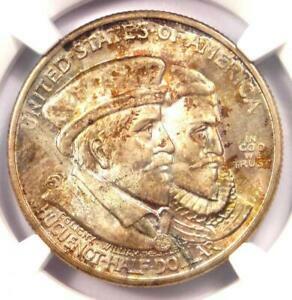 Another feature sometimes seen is a brilliant patch of die polishing visible at the upper left part of the reverse. 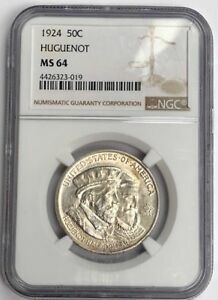 A number of lightly worn examples are known grading EF-40 through AU-58, but these are more likely the product of mishandling than of actual circulation. Places to check for wear include Admiral Coligny's cheekbone and the lower foresail and stern of the ship. 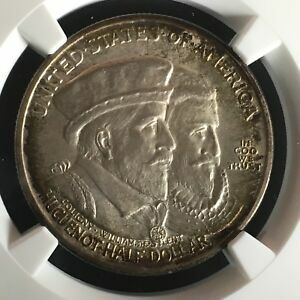 One proof striking of this coin was reported by the late Walter Breen, who named former Chief Engraver John R. Sinnock as the likely source of its manufacture. This piece is presently untraced. 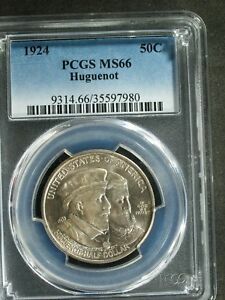 No custom packaging associated with this issue is known, although a descriptive brochure was produced with an illustration of a memorial stone and a photo of the first piece coined being presented to President Calvin Coolidge. 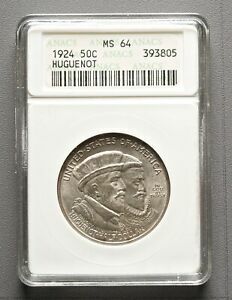 1924 HUGUENOT COMMEMORATIVE HALF DOLLAR 50C ANACS MS61 ECC&C INC.